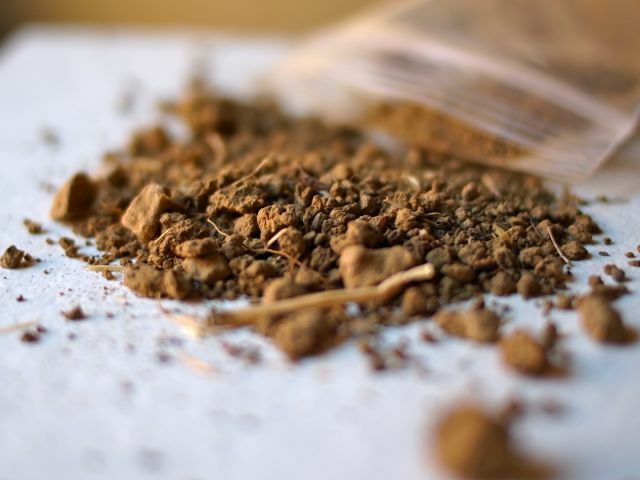 Very raw sienna, which I picked up in a parking lot outside of Sienna, Italy in 2009. I’m teaching my 18th century French class in Montefiascone, Italy, August 20-24, 2012. Needless to say I’m thrilled. All the classes look really great. In the first week, Cheryl Porter is teaching her Re-creating the Medieval Palette. I attended the lecture portion of this class when she taught it here in NYC, and it really opened my eyes. But it seems taking the class in Italy would be exceptional by soaking in the local pigments and colors — the blue of Lake Bolsena, the red of montepulciano d’abruzzo — bellissimo! The second week is Julia Miller’s The Glazier Codex. I was fortunate enough to sit in on a small portion of this class when Julia visited the Morgan Library & Museum while teaching in NYC. The class had the opportunity to spend a morning with the actual Glazier, arguably one of the most important books in the world. Julia’s scholarly knowledge of this book was impressive. Ana Beny’s The Mudehar Book looked interesting enough to me to register for it as a student. I don’t know much about Spanish binding from this pivotal time, and look forward to learning more. And in week four, I will be teaching my Eighteenth Century French Class, for the first time incorporating a lot of new research — and many powerpoint presentations — from when I was a fellow at the Morgan last fall. I think every book conservator should attend Monte at least once in their career. It generally proves to be an unforgettable experience: concentrated learning, the opportunity to forge friendships with international colleagues, and enjoying the hedonistic pleasures that Italy offers. For further information or to register for one week or more, please contact Cheryl Porter: chezzaporter (at) yahoo.com. Check out the Monte Facebook page. In case you are a little short of funds, consider applying here for Conservation by Design’s Nicholas Hadgraft Scholarship worth 1,500.00 Euros. This class will study the colours (made from rocks, minerals, metals, insects and plants) that were processed to produce the colours used by artists throughout the medieval era. The focus will mostly (though not exclusively) be on manuscript art (Islamic and European) and participants will re-create the colours using original recipes. Illustrated lectures, will address the history, geography, chemistry, iconography and conservation issues. Practical making and painting sessions will follow these lectures. The Glazier Codex contains a parchment manuscript of the first half of the Acts of the Apostles, written in Coptic and illuminated. The manuscript and its binding are thought to date from the late 5th /early 6th century. The workshop goal is to make a full size model of the original binding. The original text consists of 15 gatherings of vellum sheets, 4 sheets (a quaternion) of vellum per gathering; we will be substituting paper. The sewing is a link style variation, and we will be adding simple link style endbands. The Glazier Codex has a decorated leather spine piece that extends beyond the head edge of the spine, nearly covering (and thus protecting) the head edge of the text block. One theory is that the tail edge of the spine piece extended in a similar fashion to protect the tail edge of the text block. 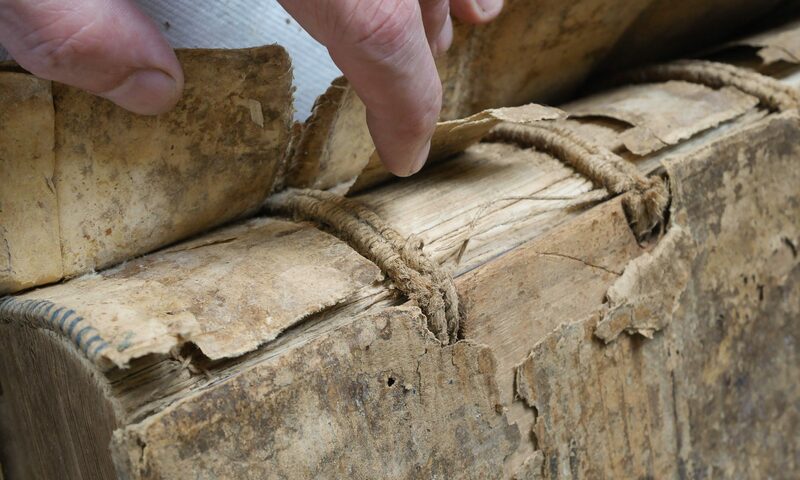 The Codex has bare wooden boards with two wrapping bands, one extending from the top edge of the upper cover, and one from the fore edge of the upper cover. Each wrapping band is finished with a decorated bone slip used to anchor the wrapped bands. There is evidence that the codex had a bookmark attached to the outer corner of the lower board. Workshop lecture and discussion will compare early codex book formats found in Egypt using images and models of early structures to illustrate structural changes in the codex. Study of the binding of the Glazier Codex will be supported through extensive images of the original. Handouts, including a reading list, will be included in the workshop materials. Basic bookbinding skills are required; we will be doing very minimal paring the leather we use for the binding but we will be sanding wood and bone so please bring a face mask if you prefer. You may also wish to bring your own supplies of materials (wood, leather, paper) to make additional models and samplers in your free time (!) from the teaching model collection, which ranges from wooden tablets and papyrus notebooks to a late-Coptic full-size model of a Hamuli cover. From Christian Spain, in the 14-16th centuries, as part of the heritage of al-Andalus, came the so-called “Mudejar” binding style – many with Gothic wooden boards and strong Islamic influences in the decoration. Through the use of Powerpoint and other resources, the course will give an over-view of Gothic binding structures and examine previous influences on its evolution and how it, in turn, influenced later bindings. Special attention will be focused on the characteristics of Spanish bindings throughout this period. Participants will construct a full-scale model in order to understand the unique features – especially those constructions that control the functioning of the spine and its movement. Students will sew the text-block, prepare the wooden boards and parchment spine lining, make end-bands, board attachment, leather covering, anchor clasps and decorate the cover. There will also be opportunity to practice the blind-tooled decoration with damp and/or heat techniques. All materials needed to construct the book can be provided, though participants will need to bring basic bookbinding tools. Some knowledge of binding is essential as is the motivation to work longer hours than is usual for the programme. Participants will construct a typical full calf late eighteenth century French binding. In some respects, this structure is the end of 1,200 years of hand leather binding; by the mid nineteenth century the mechanized publisher’s cloth case begins to predominate. Particular attention will be given to the techniques originally used to make these books, informed by close readings of multiple contemporaneous technical descriptions—Gauffecourt’s 1763 Traité de la Relieure des Livres, Diderot’s 1765 Encyclopedié and Dudin’s 1772 L’Art du Relieur-doreur de Livres—the examination of extant bindings, and the use of antique and reproduction tools. Typical features of this binding style include a hand beaten textblock, edges ploughed in-boards and colored; single or double core endbands, vellum spine liners, and several methods of leather decoration. Several presentations will contextualize the bindings and historic equipment. The numerous problems these structures pose for conservators will also be discussed. This workshop is constantly updated, incorporating ongoing research. Basic bookbinding skills are a prerequisite. Julia Miller is a bench-trained conservator who in recent years has turned her focus to the study and teaching of historical binding structure and style, with a special emphasis on early Coptic book structures. Julia has taught a variety of early structures around the U.S. and beyond, and has traveled to Cairo twice, in part to study the bindings that originally sparked her interest in early bindings, the fourth century single-quire bindings known as the Nag Hammadi codices. In 2008 Julia received a Kress Foundation/FAIC conservation publication fellowship to write a book on historical structure and style titled Books Will Speak Plain: A handbook for identifying and describing historical bindings, published by The Legacy Press and released in December 2010 (thelegacypress.com). The book is directed toward curators, collectors, and conservators, and will be of interest to book artists who draw on historical structure as a platform for their own work. Julia is currently editing a collection of essays on the history of binding and will be a contributor on the subject of American scaleboard bindings growing out of a research fellowship at the Library Company of Philadelphia in the fall of 2010; the collected essays will be published in fall of 2012. She will be lecturing or teaching in 2012 for Rare Book School in Virginia, the North Bennet Street School in Boston, the Rare Books and Manuscript program at the University of Illinois, the Oregon College of Arts and Crafts in Portland, and the Montefiascone program in Italy. Ana Beny is a freelance conservator and consultant, with her own workshop in Madrid. Since 1984, when she graduated from the “Conservatori de les Arts del Llibre” of Barcelona, she has worked on the conservation of artifacts on paper, papyrus and parchment, with special dedication to historical bookbinding. She has conducted workshops and lectured in the Montefiascone Project, Italy, Spain, Greece, Brazil, Philippines and Egypt. Currently she collaborates with various institutions, including the Polytechnic University of Madrid and with Thesaurus Islamicus Foundation & Dar Al-Kutub Manuscript Conservation Project in Cairo. The cost of the classes is: 445 British pounds ($700 US, 550 Euro) per week and includes all tuition (which is in English) and (most) materials. The Montefiascone Project is a not-for-profit organization, and all extra monies are used to finance the cataloguing and the conservation and preservation of the collection.